That night a lot of people gathered at Guangdong Association. Everyone agreed that there would be no end if Looi Hoong was not killed on the lei-tai. Chan Yuk Shi immediately asked who this capable person was. Chen Yuk Shi was very happy. Immediately he dispatched some persons with gifts to invite Wang Chen Thong. After about two hours, Wang Chen Thong arrived. Everyone had a good look at him. He was like a Vajra King. His eyes shone like comets. The white and black of his eyes were well differentiated. Everyone venerated him respectfully, and went forward to greet him. After the preliminaries, Chan Yuk Shi announced. “Tonight, we specially invite Sifu Wang Chen Thong here, and our invitation shows that we admire and respect you extremely. Nevertheless, we have an intention. Without me saying, I believe sifu knows it. Looi Hoong, based on raw courage, insults all Cantonese people to this time. As long as anyone is a Cantonese person, he suffers great hurt, and view it as a great insult. “Sifu Wang is also Cantonese. What you feel is like what we feel. But we are all traders. We don’t have the strength ‘to lift up an iron cockerel’ (which means ‘to have any noticeable strength’). Hence, after thorough discussion, we intend to invite glorious masters to avenge the dead, and remove the big insult on Guangdong. Wang Chen Thong laughingly replied in a clear, loud voice. Everyone was jumping with joy. Chan Yuk Shi ordered a sumptuous dinner in honour of Wang Chen Thong. He personally toasted for Wang Chen Thong’s success. This entry was posted in Grandmaster Wong Kiew Kit, Kung Fu, kung fu culture, kung fu sparring, legends, Shaolin, Shaolin Wahnam, stories and tagged Grandmaster Wong Kiew Kit, Kung Fu, kung fu culture, kung fu sparring, legends, Shaolin, Shaolin Wahnam, Stories on February 27, 2018 by Wei Joo Lee. While the crowd was quiet, another person flow up the stage like a big bird. The crowd noticed that he was a kungfu master from Canton named Li Foong San. The spectators cheered. After registering his name in the register of the lei-tai, Li Foong San said to Looi Hoong. “Today I come up the stage to take up your challenge is not because of the rewards, and also not because I want to avenge the dead. But I saw your cruelty and could not tolerate. I am sure you know that setting up the lei-tai is to meet capable persons of the world, and not use this excuse to kill people. Even when your art is better than other people’s, and really you are no-double in the world, you should appreciate heaven’s love for life. Against those weaker than you, just defeating them will do. After listening to this elucidation, not only was Looi Hoong not angry but he laughed out loudly. Li Foong San was surprised and did not know how to reply. Looi Hoong changed his facial feature, and continued. 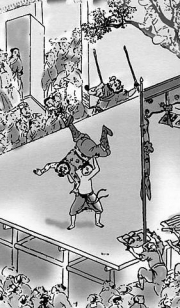 Immediately, Looi Hoong shouted, “See my technique!” He moved his right leg forward and used “Two Dragons Fight for Pearl” to attack the opponent’s eyes. Li Foong San avoided the attack and immediately used “Throw Balls in Waves” to counter attack. As soon as Looi Hoong squat down, Li Foong San retreated his front stance, and used his hand to sweep at the opponent. If Looi Hoong failed to avoid, his arm would be fractured. In this precarious moment, however, Looi Hoong was not alarmed. He bent his body and changed step, and simultaneously struck out his palm. Li Foong San was ready. Before the palm strike arrived, he had changed technique. The two combatants, one like wild wind swept leaves, and the other like a fierce tiger jumped across stream, fought on the lei-tai like dusts blown by breeze. It was difficult to explain and difficult to separate them, and they fought for life and death. The spectators below moaned and sighed. They concluded that unless there was death, it would be difficult to differentiate the higher skills from the lower. The Cantonese groups of people cheered for Li Foong San. On the lei-tai, the combatants exchanged many tens of encounters. Looi Hoong did not gain any advantage. His nature arose, his intention to kill was born, and he knew that Li Foong San’s kungfu was not ordinary, so he employed his “own door” ultimate technique – yin-yang kick. This yin-yang kick was dangerous and extra-ordinary, and Looi Hoong “had accumulated essence and arose spirit” to train the ultimate technique for all his life, and had attained success after much “bitter training”. Whenever he met formidable opponents, there was not a single occasion he did not win with this ultimate technique. Having decided on his intention, Looi Hoong used the tactic of “Majestic Hall Explain Many Things” to confuse Li Foong San’s eyesight. Then he used his ultimate technique of yin-yang kick, raising his leg to kick at his opponent with tremendous internal force. Li Foong San could not avoid the attack. With a loud noise, like a kite that had snapped its thread, Li Foong San fell from the lei-tai. The Cantonese spectators rushed to save Li Foong San, who vomited blood. But he was dead. Seeing the horrible death of Li Foong San, every Cantonese wanted to rush up the stage to fight Looi Hoong. At that time a bell sounded, and Looi Hoong walked to the front of the lei-tai and thanked the spectators with a greeting. His students accompanied him to walk away. This entry was posted in Grandmaster Wong Kiew Kit, Kung Fu, kung fu culture, legends, Shaolin, Shaolin Wahnam, stories and tagged Grandmaster Wong Kiew Kit, Kung Fu, kung fu culture, legends, Shaolin, Shaolin Wahnam, Stories on February 20, 2018 by Wei Joo Lee. After defeating Cheng Loon, Looi Hoong or Tiger Looi walked to the front of the lei-tai, or stage for kungfu combat, and said. From nowhere in the crowd came a loud answer. “Don’t boast. Today I’ll take your life.” Immediately a figure flew up the stage. Cheong Xin Harng was angry. His fists hit Looi Hoong wildly. Looi Hoong was secretly laughing. Purposely he feigned some weakness to tempt the opponent to hit futilely. Cheong Xin Harng was not deep in his kungfu, coupled with wanting to win easily. He did not know that Looi Hoong’s movements were meant to trick him, but instead wrongly thought that the opponent’s defence was weak. So he advanced and came close. Looi Hoong suddenly changed his tactics and used the pattern, “Singly Chop the Hua Mountain” to chop at Cheong Xin Harng’s head. Cheong Xin Harng could not defend. His head was broken, and his brain splashed out. He fell down dead. 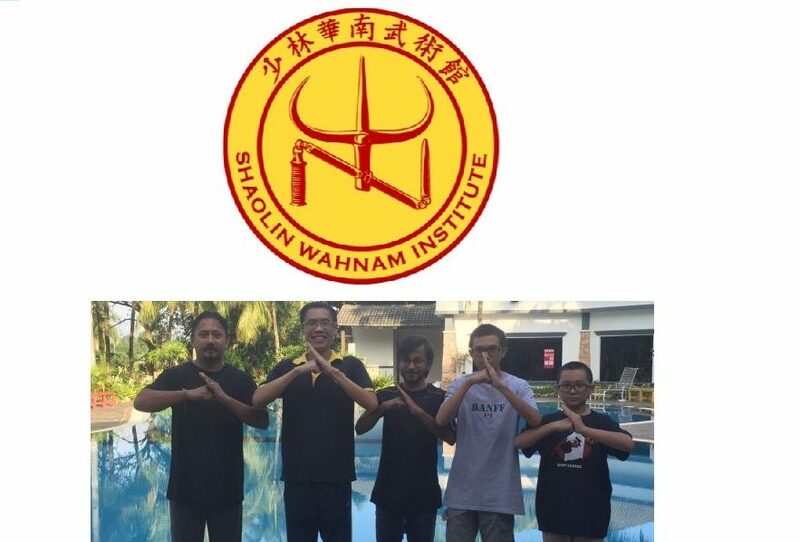 This entry was posted in Grandmaster Wong Kiew Kit, Kung Fu, kung fu culture, legends, Shaolin, Shaolin Wahnam, stories and tagged Grandmaster Wong Kiew Kit, Kung Fu, kung fu culture, legends, Shaolin, Shaolin Wahnam, Stories on February 6, 2018 by Wei Joo Lee.